World number three Serena Williams has revealed at the end of her tour to South Africa that she is in love with the African country. 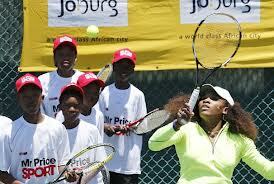 The American tennis star went to South Africa during her tour to some African countries and really liked the place. Serena was also accompanied by her elder sister Venus at this tour and the real purpose charity. However, Williams Sisters also did a lot of shopping as they liked South African fashion. Serena posted on twitter that, "I love South Africa!!!! I love it. I love it. I love it. And I love everyone here!!! You guys made my trip amaz! I can't wait to come back!" Williams Sisters were guided by Thula Sindi, who was recently named as South Africa’s designer of the year, during their shopping outing. The American sisters were taken to accessories store Egality by Sindi where they spent R8300, purchasing a Missibaba belt (R1295), a Marzipan stone necklace (R595), three Pichulik necklaces (R695 each) and gift cards. Sindi said, "I wanted to show them clothes that could travel well. Venus was especially sweet and wanted to know what the market was like here because she wanted to launch her brand here. We chatted about the joy of making clothes and she was very warm." Serena and Venus also spent R8 000 on Sindi’s designs with some of them being the ones he displayed at the Africa Fashion Week. However, most of the shopping was done by Serena, while Venus was more interesting in surveying the South African market to launch her own fashion brand. Sindi said about Serena, "They didn't waste time on niceties - especially Serena - who would say right away if she didn't like something." Later on, Serena and Venus also played an exhibition match at the Ellis Park indoor arena, which was won by the younger sister in straight sets 6-3, 6-4.